BEND, OREGON, JANUARY 31, 2019 – OUT Central Oregon, in partnership with Visit Bend and Mt. Bachelor, announce Winter PrideFest 2019, January 31 to February 3. Winter PrideFest is a multi-event weekend taking place in Bend and at Mt. Bachelor, celebrating diversity and inclusivity of our community through various winter activities, social gatherings, and fun events. OUT Central Oregon was awarded a Catalyst Grant from the Visit Bend Cultural Tourism Fund to help develop Winter PrideFest 2019. Through this generous grant, OUT Central Oregon now expands on the Pacific Northwest’s first LGBTQ+ ski weekend of last year, further promoting Bend as an attractive winter destination for the LGBTQ+ community. “We’ve put together a special weekend with numerous events for everyone to participate, celebrate, and bring the entire community together. One event not to be missed is Drag Tubing at Mt. Bachelor’s Snowblast tubing park on Saturday, February 2…it’s going to Fab, Frosty, and Fun!” – Jamie Nesbitt, President, OUT Central Oregon. 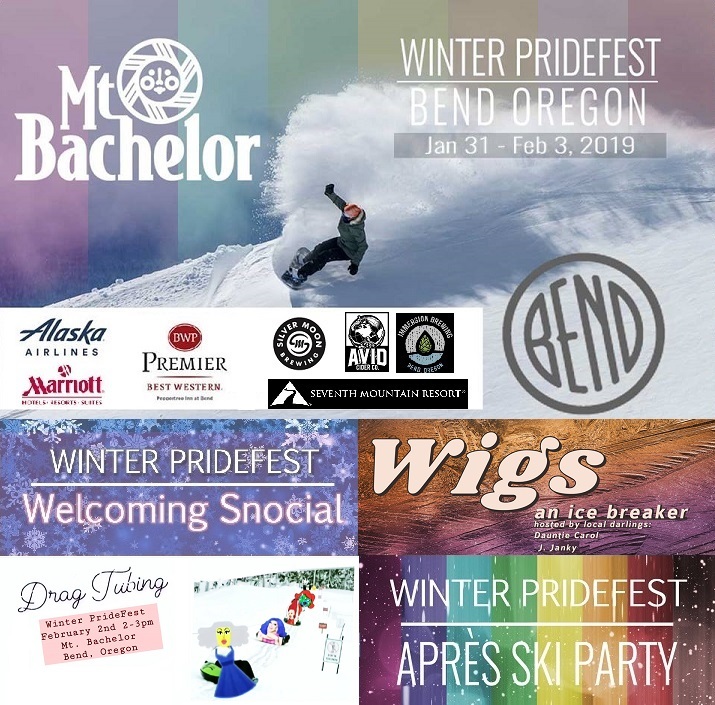 “Winter PrideFest is an amazing opportunity to celebrate the diversity and inclusivity of the ski and snowboard community here in Central Oregon. We look forward to welcoming everyone to celebrate Winter PrideFest at Mt. Bachelor.” – Drew Jackson, Director of Marketing and Communications, Mt. Bachelor.